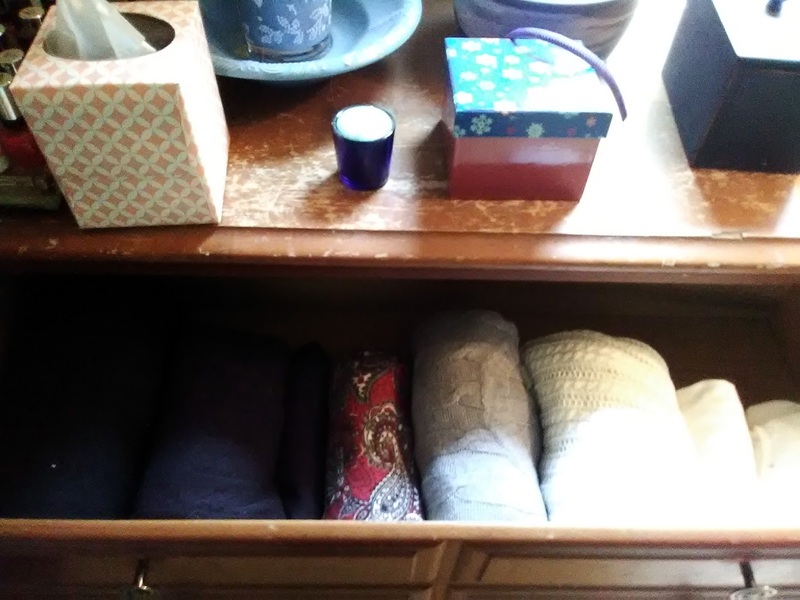 JULIA SPENCER-FLEMING: I may be the last woman in America to hear of KonMari, and that's okay; I'll own it. I had heard about some super Japanese organizing method back when Marie Kondo's first book, The Life-Changing Magic of Tidying Up: The Japanese Art of Decluttering and Organizing, was published, but the only thing I knew was A) it involved folding T-shirts like origami figures and B) it required you to talk to your socks. Now, I am not a naturally organized person - far from it. I've learned over the years that the more detailed the system, the less likely I am to stick to it. Which is why, for instance, my tax file is a large picnic basket into which I throw all bills, papers, receipts, etc. that I might need by April 15. "But Julia," I hear you say, "It must take you forever to get all that in order come tax-time." The answer is yes, it does take quite a few hours of sorting and entering into a spreadsheet for my accountant. However, it took longer the years when I would sort my bills, papers, receipts, etc. into pre-labeled folders for one month, after which they were left strewn about the house until I started having panic attacks in March. All of which is to say I was happy to let the Life-Changing Magic of Tidying Up pass me by. But no more! Yes, friends, I have seen the light, and Konverted. (Okay, that was a horrible pun.) I was following along in one of the blogs I mentioned yesterday as the blog author (blogther?) cleaned out and organized her closets the KonMari way. That doesn't look too complicated, I thought. So I checked out the book and read it. One of Kondo precepts struck a chord with me right away. Her goal is not to teach you how to buy and use better storage systems; it's to get rid of enough stuff so the storage you have works. To achieve this, you don't pick what you're going to throw away. You choose what you want to keep - those things that "spark joy" in you. I decided to translate that into clothes I always felt good in, the items I got compliments on when I wore them, or the outfits I would put on and say to myself, "Damn, girl, you look good." I took everything out and dumped it on the bed. The book says to put it on the floor, but I think maybe that's a cultural thing? Or maybe Marie Kondo doesn't have two cats who would eagerly walk all over her clothes and then lie down on them. So the technique is to pick up each item and see if it sparks joy. 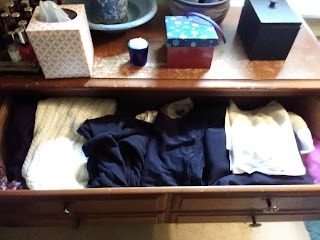 My daughters (who believe me, could both use a heavy dose of KonMari in their rooms, which by the way they refused to let me photograph for the blog) pointed out no one's underwear sparks joy. (Well, not the stuff you actually wear throughout the day. There are a few specialty items...) But there's nothing wrong with choosing to keep things that have utilitarian value. I kept several long-sleeve undershirts because they keep me warm in my drafty house during the winter, and that sparks joy. 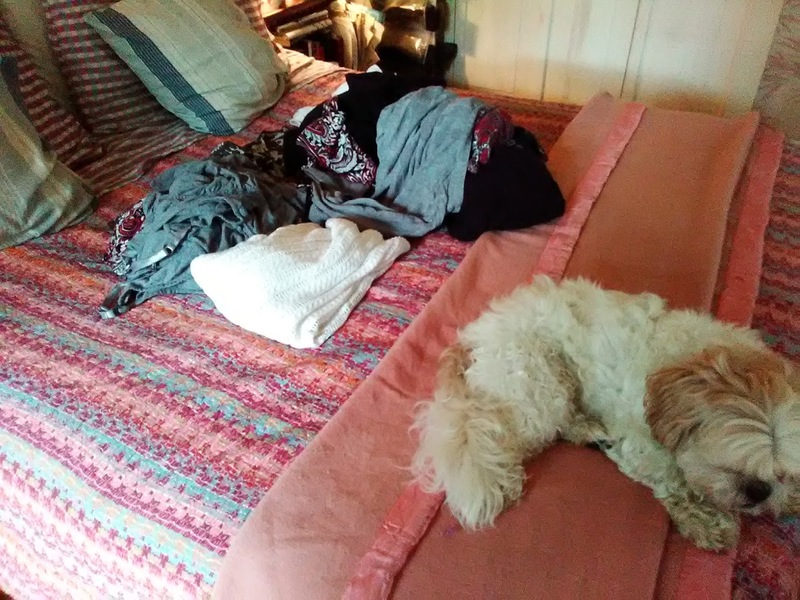 The Shih Tzu is of course optional to the KonMari process. And here's my drawer after. You can't quite see it, but there's empty space in the back! 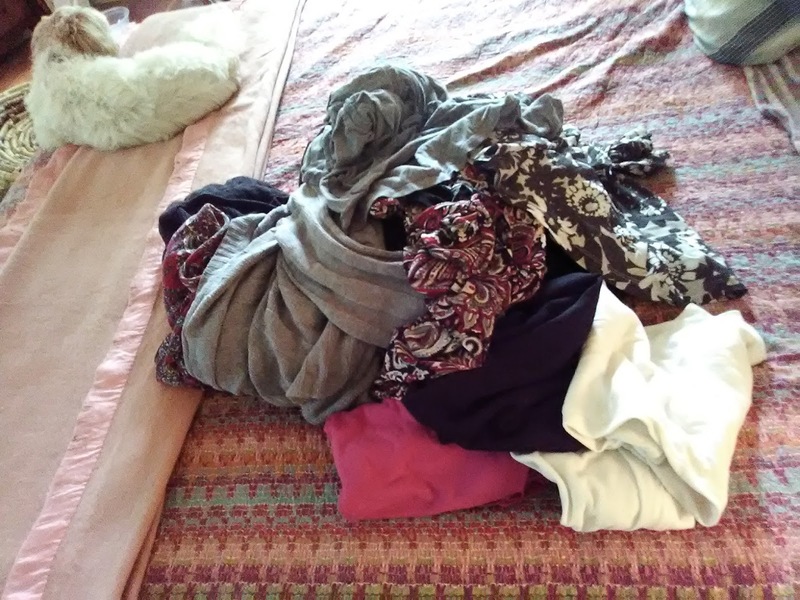 Kondo instructs one to fold clothing in a very particular way, and I was too lazy to watch the folding videos on YouTube. So I rolled my shirts and sweaters like I would when packing a suitcase. The final result: these are the clothes headed for the donation boxes! 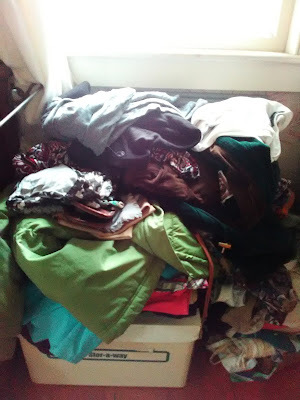 Obviously, that's from my closet and my dresser, not just the one drawer... Around October, I'll bring down the winter clothes and take another crack at them. Meanwhile, I have yet to start the next phase of the decluttering and organizing: books. I expect that will be much harder than clothing. I'll keep you posted. So tell me, dear readers, have any of you KonMari'd? How do you like to organize? Oh, my goodness, like Julia, I am not naturally organized and so I am always greatly impressed by those who possess any sort of organizational skills. Although Marie Kondo’s book is not doing a balancing act as part of my teetering to-be-read pile, we manage, in our inimitable own fashion, to be reasonably organized. There’s no real logic in our system, but since I don’t particularly enjoy rummaging around to find whatever it is that isn’t in its proper place . . . and which I am in desperate need of locating . . . we make a heartfelt stab at keeping things where they belong. Like Julia, we regularly donate clothing to Lydia’s Closet, our Church’s clothing ministry. John’s in charge of all the tax stuff [thank goodness] and I’m in charge of the books. Despite having no particular rhyme or reason as to which books go where, they all manage to make it to one of the bookshelves. So, while we’re not likely to be Konverted any tme soon, we aren’t total failures at this organization thing . . . .
Last spring I packed up my entire kitchen and dining room, saving out the minimum survival stuff, in anticipation of the renovation to the studs and rafters. Now that it is finished and now that I have more storage space than I can fill, I've yet to bring an entire box up from the basement. Mind you, the contractor stacked a few of the old cabinets in the dining room, a long with the microwave, for what we called "Ann's summer kitchen." I also had use of the range top, the sink, and the fridge for all except four days, another story. Of course the contents of the summer kitchen got first dibs on space in the new one. This weekend we plan to go through those boxes one at a time and decide whether each item should be kept and used, even for those once a year ones, like Christmas cookie cutters, or donated or sent to the curb. We also will reorganize what is already upstairs as we are already seeing that what used to be to the right of the sink now belongs on the left, and so on. It is very invigorating to be so organized and not to have everything stacked but having its own little place in a drawer or shelf. We moved into this house 16 years ago, and you would be surprised, or not, at things I hadn't touched since then. Sadly, in order to declutter my house I'd have to first kick my husband to the curb. And if the house burned down he's the first thing I'd take with me. I'm all for decluttering but I am with your kids, Julia: it's a rare piece of underwear that sparks joy. Having said that, reorganizing is one of the truly satisfying things in life. After I turned in a manuscript last week(!!) I tackled the drifts in my office. Now my wastebasket overfloweth. We recently reached clutter critical mass here, made worse by the effort of cleaning out my mother's house and moving stuff into OUR house until I could bring myself to sort through it. Two weeks ago, we rented a dumpster and PURGED. Sadly, you can't really tell we did anything. It was a HUGE dumpster. And we FILLED it. And we could probably fill another one. But we put a dent in the mess. Plus I've been inspired to continue decluttering a little at a time. Clothing has been a major issue. I like the idea of keeping what brings you joy. I'm going to use that in the future. I made a rule for myself: if I buy something new, I can't just shoe-horn it into the closet. I must toss (donate) an item for each new item I add. Earlier this week I hit the sale racks at Macy's and went into a feeding...I mean buying frenzy. Came home and made use of my new rule. Charity received a bag of some really nice things! I feel virtuous. And my closet isn't overflowing. Love, love, love getting rid of "stuff." Just purged our linen closet last week -- so satisfying! Julia, as a New Yorker, I'm amazed by the fact you have a dresser in your bathroom. We barely have room for a few towels on hooks. Macy's is safe from going out of business in the near future, since I just did the same at their sale. I'm on a plane right now, about to leave for a family wedding in California, and when I get home I'll get in the car for a two-week trip with Bouchercon in the middle. But then, when i get home again, then I'm decluttering my closet. And my husband's, too. Oh, Annette, shoes. It's embarrassing. I know, Karen. Especially since I always wear the same three pair. The spark joy thing is so successful! It really makes a difference. When you look at an item in the closet and you say: oh no, I guess I won't wear that. Why spend your life looking at things that you mentally and emotionally discard? The other thing that helps me so much is what if I have, say, three brown handbags. I only use one of them. If you say to yourself: is this the first choice ? If yes, keep it. And maybe even second choice. But your third choice… the one you never use… Would be someone else's first choice! And wouldn't it be fun to give someone that? The other thing that works, and I can say it here because it is just us: when you were getting rid of something, thank it, and say goodbye. OK, I know you are hooting, but the book suggests this, and because it is so stupid, I tried it. So I took a jacket that I never ever wear anymore, but that I somehow still like, and said to it: " thanks so much, you gave me much happiness. Now go off and do the same thing for someone else. " I know you are laughing, but it made getting rid of it so much easier. My goal this year has been to organize paperwork. I keep thinking that once all the papers are in order I'll feel inspired to work on closets and drawers. I have done so much shredding of papers that I had to buy a new shredder. The motor in the other one burned out. Today is the last day of my vacation and I have not completed even the tiniest organizing project! My excuse is that I've been away for a lot of the past three weeks and never had time to get anything started on the days that I've been at home. There may be time later today for me to reorganize the tea section of my pantry. I do love my tea, although I am drinking coffee right this minute. Oh, another person who keeps all her tax records in a basket. Yay! I'm not alone! I've never done the KonMari thing, but with the change of seasons I look at the clothes I have. Did I wear them in the last six months? No? Off they go. Shoes - well, I sadly gave way to the fact that I will never wear three-inch heels again. Off they went. Our church has a St. Vincent de Paul donation box in the parking lot and we are regular contributors. I don't know if I could do the "gives me joy" thing. I have a lime green fitted button down shirt that I adore. I always get compliments when I wear it. The color was a real step away from my comfort zone when I bought it. But...it's got stains in the armpits that I absolutely cannot get out. So while it still brings me great joy, I had to let it go. Sigh. I deliberately stayed away from the Macy's sale racks the last time I was there. Talk about temptation overload! Haha! You are definitely NOT the last woman in America to know about KonMari! Goodwill. Still. I can't seem to totally purge. Or keep things tidy. The rush to find THAT special vintage tee shirt! Anyway thanks for the laugh. I found you all through Hallie Ephron's site (via Writers Digest ad for an online course). Your after photo looks amazing, btw! Welcome Maureen! Where are you? Hi, Maureen, glad you found us! And thank you - I felt positively euphoric when I saw a clothing drawer with EXTRA SPACE. "Do you need to keep this? Does it fit? Did you wear it?" He almost always starts out needing to keep it, but eventually, with patient questioning, he'll allow as some items can go to the donation box and some into the attic. Yes, Julia, tax things in a basket! Which I'm dealing with TODAY! Seriously, the cash receipts are in a basket; everything else is on the computer or in bank or credit card statements and all the relevant stuff (I hope) has been in one pile on my desk for months. I have read a little Kon Mari, and while I liked her "thanking things" and keeping things that "spark joy" philosophy, I couldn't deal with the "take everything out at one time" part. I made a big effort with my closet last year, and I still have things I don't wear. Time to try again. And like Hallie, having finished a manuscript, I desperately want to attack everything in my house that needs decluttering and fixing up--and that prospect is enough to make me hide under the bed. I decided I'm going to make a list for each room and tackle on room at a time. Hmmm. We'll see how that works. it took me a year and a half to clean out my house. (It started with a New Year's resolution to get rid of 100 items every month.) I discovered the key to household organization is truly getting rid of crap. (I kept so much because I was sure my daughters would appreciate my good taste and want my castoffs....uh....no.) I am not kidding when I say the moment I put the very last keeper in place, out fell a signed Miro print I had forgotten I owned. Now it's framed and hanging in my newly clean living room. It was miraculous! The universe rewarded me! Several of you have mentioned husbands and I thought maybe mine was okay. Except I just went upstairs and there are piles of clothing everywhere. I don't know if it's a purge or not. Hmm. Oh, and someone mentioned books. The Hubby and I are both bad about keeping books. But after a wobbly stack fell on my foot and left bruises, I had to do it. Purged my bookshelf (not the built-ins we share, just my personal books) of everything that wasn't dear to me. I did it. But man, it kinda hurt. Emotionally, that is. gosh I almost forgot to come over today--and all the fun I would have missed! We are trying to slowly slowly declutter, without assistance from a book. I suggested to John that we start in his office (I'm no fool) which also had all my father's records and some stuff from my psychologist days. I lasted a half hour before I had to go lie down. the need to shred is a real pain. Love all your stories today--thank you!! Lucy/dearest Roberta----at first, I counted individual pencils. But eventually a whole box of unusable office supplies counted as one thing. There's a momentum to cleaning out crap. But I confess I have left my office for another time. Keep going! When you find 200 pencils too dull to use, everyone knows you need to ride right over to Staples and buy yourself a pencil sharpener. I definitely feel the need to de-clutter. However my self diagnosed ADD fights it. We have so much stuff in our house sitting in piles, the result of my husband having to clean out his parents' house before selling it. And he's looking for a job, so that is his excuse for not getting to removing these piles. Including the big fat one in the middle of the kitchen floor. The one I ask him to remove every week. The one that he says he absolutely will take care of later that same week. Ha. To add to my frustration he doesn't necessarily get rid of stuff. He parks it at a rented storage unit so he can go through things later. We do pass along a lot of stuff to the Salvation Army and to the church's thrift shop. So maybe this long weekend that pile in the kitchen will vanish. I've believed for a very long time that organization is the defense against chaos. I try to always put things, and keep them, in the same place, so I can find it next time. The peeler goes in That kitchen drawer, the pizza cutter goes in That one, etc. My wife tends to just drop things in Any Old Drawer, which means half the time I can't find it without looking all over the place. She leaves her purse here, there, anywhere, same with jacket ("which closet did I put it in?") and so forth. Drives me nuts. Organizing? My grandfather taught me "a place for everything and everything in it's place" and I've lived by that. I have maybe four or five items of clothing that don't fit, but are close, and when I lose a few more pounds... No clothing is in boxes, I only use half the dresser (wife has the other half, and both nightstands and the shelves in the closet, and 2/3 of that closet. Oh, but I have stuff. two or three thousand books, all on shelves. Nearly a thousand CDs, in their jewel boxes, also on shelves. The gardening tools are all hung on nails or hooks in the garage. Screwdrivers in a rack. What else is there? The books give joy, just sitting there. Books I don't expect to re-read I get at the library (yay, libraries!). So I figure I don't need this system, and I don't want to get rid of books or CDs, so what's left, really? As I was just reading the last couple of posts, part of my To Be Shredded pile collapsed. That's quite impressive, Julia, what you accomplished with your clothes. Did you go through moments with certain items you haven't worn for a while, for one reason or another, of thinking I might just be in need or want of this someday. I am not a good declutterer. I'm aware of KonMari, but I haven't tried her method. However, I do have a method that is fail proof. It's called Ashley Marie, my daughter who is a speed declutterer. She is extremely organized and weeds her and her family's belongings constantly. I use her sparingly at my house because she has no mercy on me. Hahaha! And, yes to the basket for tax items! Kathy, would Ashley Marie come to Dallas??? Hahaha, Debs! I'll send Ashley Marie your way.